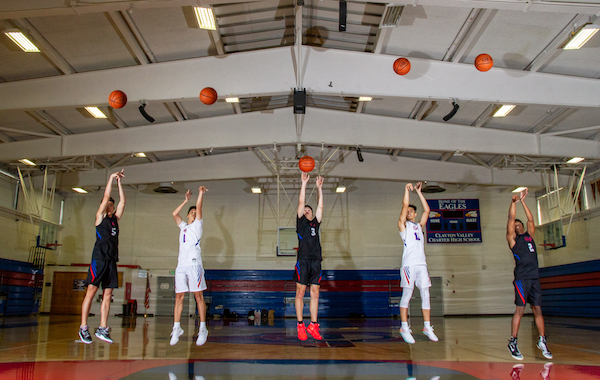 Led by a trio of talented seniors, Clayton Valley Charter High-Concord opened its 2017-18 season with 18 straight wins. The Ugly Eagles were seemingly leading the charge of a wave of suburban public schools experiencing historic seasons. And despite all the fanfare, and the program’s first appearance in a North Coast Section final, the script didn’t get the Hollywood ending. Clayton Valley went just 8-4 over its last 12 games. Not a single banner was raised. No league title. No section title. And a one-and-done trip to the CIF Northern Regionals. 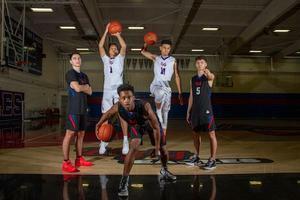 Now those three seniors are gone and the remnants of perhaps the East Bay’s deepest team are ready to prove there’s more to the story. The Ugly Eagles appear built for that challenge, too. Clayton Valley returns 12 players from its postseason roster a year ago, with as many as eight players who were part of the team’s deep rotation. Merritt is one of two returning starters along with Zach Martinez, and together they comprise a group of seven seniors who will power an engine that expects to run at full throttle at all times. Graduated seniors Garrett Pascoe, JD Martinez and Nick Klarman took a lot of the team’s height with them. What’s left behind is a full stable of shooters with plenty of speed and athleticism. That would certainly raise some eyebrows, considering the Ugly Eagles averaged 77.2 points per game last season. But first-year coach Andrew Doss thinks it’s definitely possible with this group. And this is a group he knows well. New head coach Andrew Doss takes over after five years assisting former coach Eric Bamberger. Doss has coached some of these seniors from as far back as fourth and fifth grade. 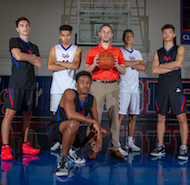 He’s been present throughout their high school careers while serving as an assistant for five seasons under former coach Eric Bamberger. He’s taking over the program after Bamberger stepped down in order to watch more of his two kids’ playing career. His daughter, Ali, is Washington-bound senior post for Carondelet-Concord, and son Mason is a freshman at De La Salle-Concord. The history the seniors share with the coach, as well as the history they share with each other, will be the emotional anchor of this team. Merritt and Martinez have known each other since second grade. Fellow seniors Cooper Dadami and Sinjin Speer have known another for just as long. 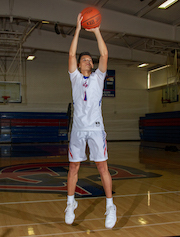 A fifth senior, Jeryn Williams, transferred in from De La Salle prior to last season but has still known and played AAU with Dadami and Speer since middle school. Their trust in each other goes a long way. Sinjin Speer is perhaps the most accurate of the Ugly Eagles sharp-shooters. He made more than 70 3-pointers as a junior. If all goes to plan, it will be through high-pressure defense and a lot of outside shooting. Speer leads a group of elite shooters throughout the roster. He made more than 70 3-pointers over the team’s 30 games last season. Klarman was the only Ugly Eagle to make more. Dadami, Williams and Martinez are all equally dangerous from outside the arc. Meanwhile, Martinez and Merritt are tenacious on-ball defenders who should make life difficult on opponents. If there’s one concern, from the coach on down, it’s rebounding. Tyler Krieg, a 6-foot-7 senior, will provide an inside presence, but the majority of the rotation ranges from 5-11 to 6-3. 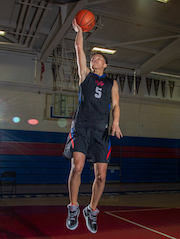 Combo guard Cooper Dadami has taken over the primary leadership void left with the graduation of All-Norcal guard Garrett Pascoe. One thing that hasn’t had to be drilled into the minds of this team is what was left unaccomplished last season. 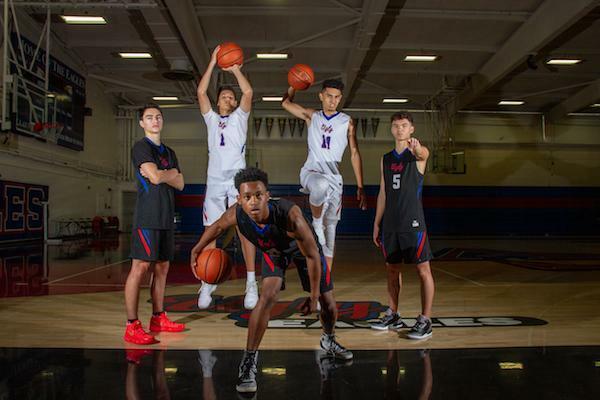 Clayton Valley finished one game behind first-place Las Lomas-Walnut Creek in the Diablo Valley-Foothill League. Then after reaching the NCS Div. I championship, the Ugly Eagles came up five points shy in a 71-66 loss to Heritage-Brentwood. Then finally, just a few days later, the No. 4 seed Ugly Eagles lost their CIF regional first-round game 65-61 on their home floor to 13-seed Menlo School-Atherton. 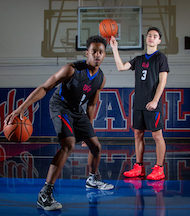 Clayton Valley will open its season at the NorCal Tip-Off Classic showcase at Newark Memorial High on Nov. 24. They’ll take on Folsom, a CIF Open Div. team a year ago. Will it be the first of another long winning streak to open the season? At the very least it should showcase a team ready to write its new chapter.